It’s a Wrap: Martha Stewart’s Cooking School has completed taping! Martha has completed taping her new show for PBS, “Martha Stewart’s Cooking School”. To celebrate, she hosted all involved at a Moroccan feast, or “bisteeya”, at her Bedford home. You can see many photos of the feast, as well as its preparation, on Martha’s blog. 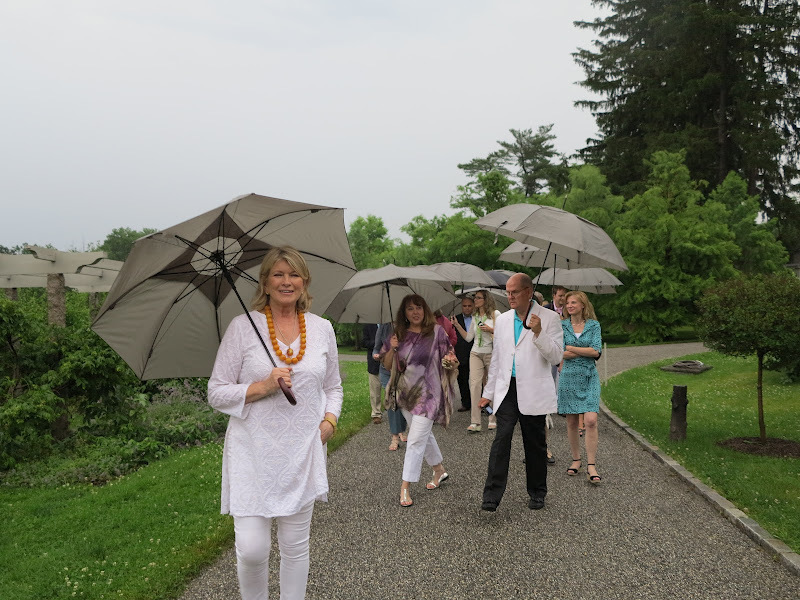 In the photo above, from Martha’s blog, Martha, appropriately attired for the evening’s theme, is leading partygoers on a rainy day tour of her farm. What do you think, FOMs: Will you be watching and learning from Martha this fall? I can’t wait! The PBS show will be different than these enhanced editions, but these should hold you FOMs over until fall. Enjoy! As I mentioned, last Friday evening I hosted a dinner party for thirty guests. We recently finished taping Martha Stewart’s Cooking School, which will be airing on PBS this coming autumn and I’m so excited! This dinner was for people who worked on that show’s production, both from PBS and MSLO. via A Moroccan Feast at my Home – The Martha Stewart Blog. After an onsite inspection by local officials, the large storage building Martha has planned for her 137-acre Bedford Estate has been approved. It is important to note that not a single one of Martha’s neighbors (including next-door neighbor Ralph Lauren) appeared at a public hearing to voice opposition. We all trust Martha will do the right thing, right? Myself, I am looking forward to seeing what this large building will look like. We already know the plan is to paint it “Bedford Gray”, the signature color of Martha’s New York estate. FOMs, what do you suppose Martha will store in this large building? Wetlands inspectors agreed no special permit was needed for a new 3,200 square foot storage shed on Martha Stewart’s property, following on an April 12 site visit to the site on Girdle Ridge Road. via Martha Stewart’s Proposed Storage Building Meets Inspector’s Approval – Bedford-Katonah, NY Patch. Now, we all know Martha’s giant storage building will be gorgeous, right? I mean, one can practically eat off the floor of her stable, which has its own dedicated kitchen, of course! Nevertheless, planners from the Bedford Planning Board will be making a visit to Martha’s home, just to be sure she isn’t planning anything untoward. My question is this: How can I become a member of the Bedford Planning Board? Planners have scheduled a field trip to Martha Stewart’s 137-acre estate to be sure that the spot where she wants to put an oversized storage building won’t harm nearby wetlands. The Bedford Planning Board is considering the celebrity’s application to build a 3,200-square-foot storage building on the border with Ralph Lauren’s property on Girdle Ridge Road, south of downtown Katonah. The 4-acre zoning in Stewart’s neighborhood limits buildings of this type to 2,500 square feet, so she would need a special permit. The building would be 25 feet high and finished in metal siding. The color: a shade of gray known as Bedford Ash. The field trip is planned next week. 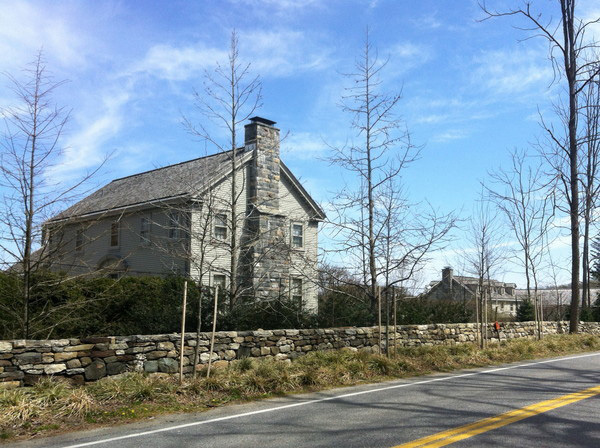 via Bedford planners to make field trip to Martha Stewart’s estate | The Journal News | LoHud.com | LoHud.com. The lifestyle guru wants to build a 3,200-square-foot storage building on her 137-acre estate, near the property line with her neighbor, Ralph Lauren. Stewart’s plans were to go before the town Planning Board on Tuesday night. She needs special approval because the 4-acre zoning in her neighborhood allows accessory buildings of no more than 2,500 square feet. It was not clear whether Stewart herself planned to attend the public hearing, as she has for other applications on her property. The 25-foot-high building would be set back well off Girdle Ridge Road along a private entrance to the celebrity’s estate. It was not clear what Stewart planned to store in the proposed structure. The property is in a wooded and well-kept neighborhood south of downtown Katonah that is adorned with stone walls and rural landscapes. It is tucked between the John Jay Homestead National Landmark and the Caramoor Center for Music and the Arts. via Martha Stewart plans 3,200-square-foot storage building in Bedford | The Journal News | LoHud.com | LoHud.com.